Depending on the size of your yard and how many trees you have, sometimes just a standard leaf blower just won’t cut it. 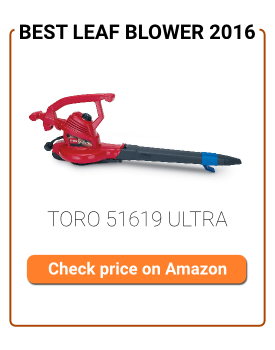 That’s why we present to you the Toro 51618 Super Leaf Blower Vac. Not only will this blower take care of moving any amount of leaves that you have in your yard, but it can also vacuum and mulch them up with ease. Raking, or even blowing, leaves can be a pain. With this 3-in-1 blower, not only will the job get easier, but you will save yourself a lot of time as well. One of the most underrated characteristics of this leaf blower is its ability to quickly transition from a blower to a vacuum. Instead of having to bend over to pick up leaves and put them in bags, you can just flip a switch and vacuum them up. The mulcher will chop the leaves into tiny pieces enough to turn ten bags of leaves into one. The two-speed motor is convenient because sometimes you don’t need a lot of power to do a job. In fact, high power can just create a bigger mess when you are blowing leaves or debris off of a deck or patio. Being able to quickly slow down or ramp up the air speed makes the job a lot easier. The Toro 51618 Super Leaf Blower Vac also comes with different tube connections to help you do any job. If you’ve got some wet leaves or need to get into hard-to-reach cracks, then there’s a connection designed for just that. While the vacuum/mulcher combination is convenient, it also causes the most problems with this unit. Depending on the size of the leaves, and if they are wet, you may experience a clogged motor. It’s not too difficult to unclog the motor, but it can be burdensome at times. At times, the cord will pull out of the socket if you get a little to far out of reach from your extension cord. This is obvious, but you will have to be aware of that since the design of the blower isn’t suited for keeping the cord plugged in. No one enjoys bagging up leaves every fall season. That’s why this is a leaf blower that you must have. 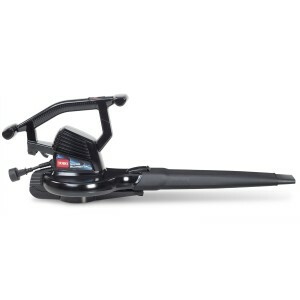 It is an electric blower, so you don’t have to deal with the mess or hassle of filling it up with gasoline. It is also quieter than the gasoline versions, so you won’t have to worry about committing any noise violations. If you have a small-to-medium sized area at your home, then this is the perfect fit for you. It’s not overly powerful, but it will get most jobs done efficiently. It is lightweight, but don’t let that make you think that it is cheaply made. The lightweight construction is actually beneficial because it will allow you to work longer without getting tired or experiencing any pains. For the price of less than $60, you just can’t go wrong. You may not have heard of Toro before because they cater a lot to professional contractors and larger entities. However, that doesn’t mean that they don’t provide quality products to regular consumers. They have been building quality lawn equipment since 1914. They are an American manufacturer of a variety of lawn equipment, like leaf blowers, mowers, snow blowers and more. The Toro products aren’t sold at all retailers and home improvement stores, but the largest chain store that they are in is Home Depot.